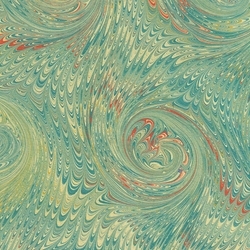 Handmade Italian Marbled Papers - Beautifully handcrafted marbled paper made by a 2nd generation marbling artist in Italy. Each sheet is produced in an eco-friendly manner with the same time-honored materials used since the 8th century. Each sheet features a fine, delicately marbled pattern. Hand-marbled on light yellow acid-free paper. Sheets measure 19.7x27.5 inches. No two sheets will be exactly alike as that each is truly an individual work of art!